Little mama mouse dreams of a hot bath and a long nap. Her babies have grown up and moved away from their snug shoe-home. Mama imagines settling into a quiet life, until Tortoise, Hare, and other storybook strangers turn up in search of a home. Soon Mama has a busy life--and lots of new friends--in glorious Shoe Town. 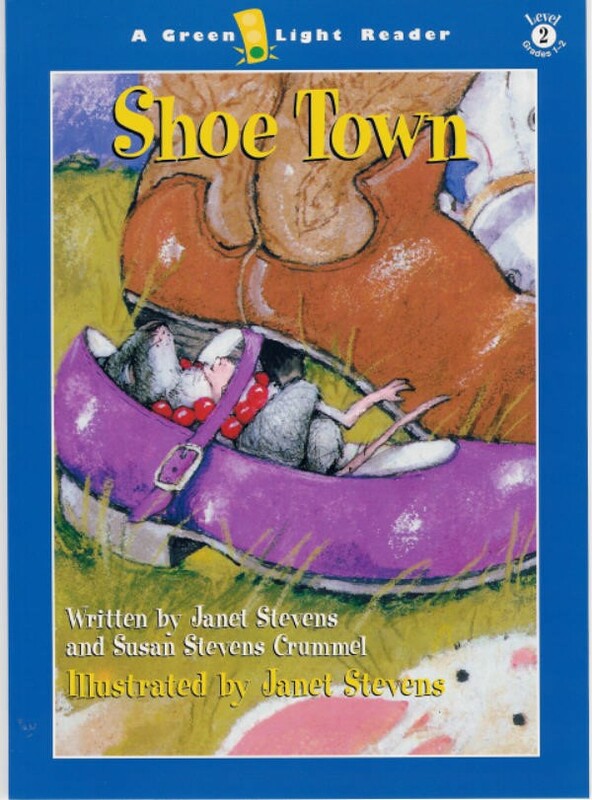 Janet Stevens and Susan Stevens Crummel’s toe-tapping rhymed text in tandem with Janet Stevens’s soleful illustrations gives the notion of one mama’s “empty nest” a hilarious kick. "Written in rhyming couplets, Shoe Town is the best of the bunch. After her children move out, a mother mouse just wants to relax in her shoe home. Various nursery-rhyme characters ask to move in, but she insists they get their own shoes. The cow jumping over the moon keeps count of the population of "Shoe Town" as it grows. Stevens's illustrations are irresistible, and the tale works well as a read-aloud or read-alone."